Announcement We will be on vacation and returning 3/24/19. Any ordered placed after 3/7 will be processed after 3/24. Offering Personalized Beach name Photography which is a unique gift for any special occasion or celebration such as weddings, birthdays, retirements, showers, memorials, anniversaries, house warmings and yourself. It’s a wonderful way to celebrate life! Personalized Alphabet Name prints, Table cards, place cards and non personalized photographs I carry in stock year around. Alphabet name photographs are created upon order request and can be ordered anytime. My photographs are taken on the beaches of Cape May, NJ. My photographs are not computer generated, all personalization elements are actually hand written on the beach by me. Each photo is printed on special Metallic VC Digital Paper which gives the image exceptional detail and depth. Accessorize you beach wedding or Give a unique gift to yourself or someone you care about today! We will be on vacation and returning 3/24/19. Any ordered placed after 3/7 will be processed after 3/24. Amazing! They are exactly as pictured. Makes me happy to see the joy people get from my work. Thanks for another 5 star rating! Another satisfied customer! Thanks for the 5 star review! Everyone is really liking my new items! 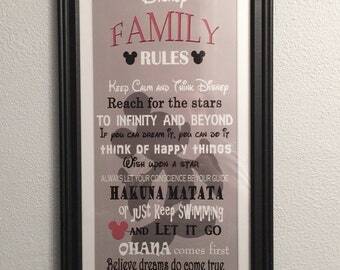 Family Disney rules sign. First shipments have already gone out to my customers. All photos will be created and printed based on the information provided in your order. If you forget to enter the information in "Message to Seller" I will convo you. All personalized messages are handwritten by me and are not computer generated. Sandwriting by the Sea maintains the copyrights to all its photographic prints. All images listed are exclusive property of and are protected under the United States and International Copyright Laws. Watermarks appear in listings for the protection of my work and will not appear on on any photos. With the purchase of any digital image you are given permission to make reproductions of the photos for **PERSONAL USE ONLY**. I want everyone to love their Sandwriting photographs! If you are not 100% satisfied please contact me. There will be no cancellations, refunds or exchanges due to the customized elements of the prints. Any other refund or exchanges will be determined on a case by case basis. Return shipping cost will not be refunded and is will be the responsibility of the buyer. International Orders - Returns will not be accepted due to customs fees. I accept all major credit cards which are paid through PayPal. With PayPal, you may use your Visa, MasterCard, American Express or Discover card. All payments made through PayPal are safe and secure. you don't need a PayPal account to pay for your order through PayPal. Click the payment button and it will give you the option to pay with credit card without signing up for a PayPal account. I am required to collect 6% sales tax on all PA orders and will be included in your payment. *Orders are scheduled for processing upon PayPal payment received and the order it is received. If you are ordering for a Special Occasion please order in advance of your event to allow enough time to complete your order (See CURRENT PHOTO SESION SCHEDULE at top. I can occasionally do rush orders if you are in need of something sooner, please convo me to see if I can meet your needs. All orders will ship to the address provided by PayPal/Credit card processor. To ensure timely delivery of your order please make sure your PayPal/Credit Card address matches your Etsy address. I will be happy to ship to a different address if you are purchasing this as a gift. Please provide mailing address in the when placing your order or convo me. All US orders are shipped through USPS with confirmation delivery for US shipments. Insurance is not covered. If you would like to insure your package, please contact me. International orders are shipped via USPS 1st class international mail or Priority International depending on the size of the order. Any customs fees, taxes, tariffs, duties, etc. are the customer’s responsibility and are not collected at the time of the sale. Returns will not be accepted due to customs fees. International shipments may require additional time due to individual country requirements. FYI..I offer JPEG files for sale which will help save on shipping and customs fees. Please convo me with any questions or special requests you may have before you make your purchase to make sure we can accommodate your request. Feel free to make a special request if you don't see it offered. Special pricing may apply depending on cost of additional items. When ordering please be sure to chose the correct size and description for your photograph.